Meadows Regional Medical Center recently opened a new 57-bed facility with a digital imaging department. The imaging staff share some lessons they learned on their journey that could help your facility. Any seasoned radiology professional knows all too well the headaches a system or equipment upgrade can bring. So transitioning an entire department to a new facility has the potential for one lasting migraine if proper preparations aren’t put in place. Director of Radiology John Harrell, RT(R), and his department employees envisioned a smoother end result when hospital leaders decided that Meadows Regional Medical Center, a small county hospital in southeast Georgia, would move to a new facility that would allow for more space and newer equipment, ultimately providing better patient care in a new 57-bed hospital. Originally erected in 1963, Harrell says hospital leaders reached the decision several years ago that the facility would not pass a Joint Commission inspection due to its age. “Patient/exam numbers created a maximized effort to treat the patient in a minimized area. The hospital was small and crowded, limited [in] patient availability, privacy, and storage,” Harrell says. The myriad costs of running an older facility were also taken into account in the decision-making process of whether to renovate or build at a new location, according to Harrell. “The cost of upgrades to the old facility would be high just to pass different state and federal codes, and this would be faced every few years,” he says, “not to mention the location allowed no room for expansion to the existing structure. “The community’s need to attract physicians to our area was also compromised because of a lack of a quality facility and equipment,” Harrell adds, noting that a newer facility was viewed as a solution that would partially, if not fully, solve these dilemmas. The new facility also boasts various technology upgrades. Meadows replaced its four-slice CT scanner with two Toshiba Aquilion Premium 160-slice scanners. “The technologists certainly know the more volume a CT can provide, the more information you can provide for the diagnosis of your patient,” says Harrell. MRI received an upgrade in the way of a Toshiba Titan MRI system with a 1.5T magnet and eight-channel coil technology. The facility upgrade was considered a success, although it did present staff with obstacles to overcome. To assist others considering making a similar switch, Meadows’ radiology employees offer their thoughts on lessons learned through the process of upgrading their facility. 2. Get (and keep) everyone on the same page. 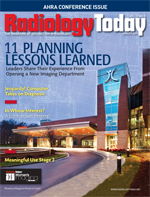 With so many new technology pieces, radiology managers wondered how they would train the staff and move to the new facility at the same time. The fact that much of the training would be done in California, a long way from Vidalia, Ga., proved another hurdle. Enter a massive calendar, which allowed everyone to post their comings and goings as well as dates important to all in the department. “We decided to use a wall in radiology and create a continuous calendar that staff could add thoughts, timing of events, deadlines to be met and, most specifically, training—who and where everyone was to be,” says Harrell, noting that the calendar was integral to keeping everyone on the same page during this time. Harrell adds that such a last-minute change suggests that other departments looking to transition to new facilities may want to invest time into practicing the patient flow scenario, on a daily basis even. 4. Confirm broadband capabilities. PACS administrator Jim Welch explains that Meadows upgraded its PACS system during the facility transition to handle all equipment upgrades. “This addition allows the facility to be integrated with all medical centers that would request exams done in our facility. A physician in another city can use our system to see his patient’s exams just moments after they have been performed,” he says. 5. Make sure there’s enough space. Adequate space is imperative. McCallum saw space as the transition’s biggest challenge: “This hospital is much bigger than the area we had in the old facility, but even with that said, we can see many areas [where] larger CT suites would have been very beneficial. The challenge is [determining] a large enough working area for growth that the facility can still afford to support financially. “Your area, while looking large when empty, is a lot smaller than you realize when all the equipment is in it, so that needs to be taken into consideration,” adds McCallum. Mallisa Claxton, ARDMS, Meadows’ ultrasound supervisor, didn’t realize ultrasound space was such an issue until midconstruction. “[Halfway through construction, we discovered] that our room size was not adequate, and there was not a direct entrance to the bathrooms from the ultrasound rooms. The need for this is important for pelvic study patients,” she says. To solve the problem, a last-minute decision was made to transform an additional mammography room into an ultrasound room. Claxton says technologists should be mindful of the configuration of the space they are allotted for their work areas. 6. Keep communication lines open with construction teams. McCallum says some obstacles grew out of a lack of communication between the construction team and the hospital team. “Sometimes we would come and tour the area and find a change that was made that we weren’t aware of,” says McCallum. “This project, although routine for others, was huge for us.” Putting in the effort to communicate the department’s needs and following through proved beneficial in the end for Meadows staff. Diane Gedeon, CNMT, nuclear medicine supervisor, says it helped that each department was given a proposed drawing of the new department’s layout. “Naturally, each department focused on its own floor plans, not necessarily relating them to the whole facility as being an integrated environment,” she says, noting that interdepartmental meetings and strategies could go a long way in making the move even more cohesive. 7. Consider temporary IT help during the transition. “I think that making sure all the ports and connections for computers, printers, fax machines, PACS, including IP address, is a much larger job than anyone realizes,” says McCallum, who believes a few temporary IT employees could have aided this part of the process and led to a smoother transition overall. “The IS [information services] department was overwhelmed and overworked during this period,” McCallum notes, adding that an especially helpful IS department, even under an inordinate amount of pressure, helped alleviate many headaches for radiology. 8. Communicate with patients to garner their support. How much information to give patients about the transition is a discussion worth having, as the unknowns of change—even good change—can be unnerving for anyone, including patients. “Some of the community supported the decision to build, while others thought it wasn’t necessary,” adds Gedeon. But she says communicating some of the more superficial but overall crucial details that went into the decision-making process to patients with misgivings helped clear up any uncertainty or reservations coming from the community. “Explaining space and power requirements and cost of rehabilitating an old facility to accommodate this helped elevate doubts of the community,” she says. 9. Involve hospital employees. “The hospital had teams that were responsible for different parts of the transition. Of course our strategy was to move everything and everyone with as little disruption as possible,” says McCallum. She says with many departments either sharing or contributing equipment that might have otherwise been discarded, this project even helped reduce costs for furniture, desks, etc. 10. Build a flexible staff. With a multitude of training sessions, trips to California, a flood of new patients to a new facility, and many other factors, employee schedules changed almost hourly. As such, the technologist staff’s willingness to adapt and be flexible aided the department transition immensely. “Much supervisor conversation occurred at the end of each day when tomorrow’s schedule would be discussed,” says Marisa Hatton, RT(R)(M), mammography supervisor. The staff responded in different ways to these changing schedules, and Hatton says staff members who were modality cross-trained were invaluable. 11. Plan ahead and then plan some more. What can be small problems to fix during the beginning stages of the construction of a new facility can turn into workflow annoyances that department employees will just have to live with down the road. “If you go over the new department plans 100 times, go over them 1,000 times,” says Harrell. Continuously look for details such as CAT5 network drops, emergency outlets, and automatic door openers and even visit area hospitals for good ideas you might otherwise miss. Spending too much time on such workflow intricacies is something you aren’t likely to regret. — Juliann Schaeffer is associate editor of Radiology Today.